Words by Kevin Doocey on December 10, 2009 . Being a young footballer at any club is a dream come true. Playing for local team and the club you’ve supported all you’re life is a boyhood dream. Money, women and the many other commodities of modern footballers has saw many of them fail to make the cut in football with their respective clubs. Not because of a lack of talent but because of a lack of maturity and responsibility, some thing that comes with age. Playing for Newcastle United has been Andy Carroll’s dream for quite some time and this season he made his big break through for us. It’s fair to say we’ve had our fair share of controversy at Newcastle, from the likes of Joey Barton, Charles N’Zogbia and even stretching back to Kieron Dyer & lee Bowyer, in ‘that’ infamous’ moment. Carroll who was led away in cuffs’ in the early hours of Monday morning, has a lot to answer to. Why was he out socialising, on a Monday night, before a training session the next day and indeed why was he out so late? How did he get involved in this bust-up? We don’t know all this but the club, Newcastle United, are holding an internal investigation about the ongoings of that Monday night, in which saw Andy Carroll arrested. Later he was released and Hughton refused to comment on the incident. However, the fact that Carroll sat the Coventry City game out in the stands of the Ricoh Arena suggests that there is something to this story. I’m glad to see that the club are getting it sorted but Andy needs to learn his position at the club. He’s living the dream, and he better realise that. 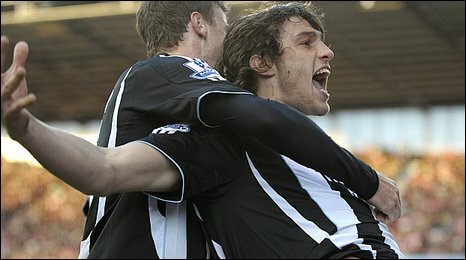 he’s not bigger than the club, no player in the world is, he’s not too big for the current Newcastle United team either. Let’s hope he learns from this and that it doesn’t happen again. If it does, then there’s one route Carroll is going down, and I don’t want to mention it. everyone makes mistakes, lets just hope Andy learnt something from his. Would be gutted to see andy go, either because he was sold or other clubs want him. He has what it takes to be a good striker, maybe not the best, but certainly, from what I saw, he can be as good as the likes of Heskey and Carew, if not better. lets just hope this won't happen again.